Everyone knows habitats are sustained by the evaporation & precipitation cycle of water, but seeing is believing. Along the coast in the town of Culasi in Antique, that cycle was at work. 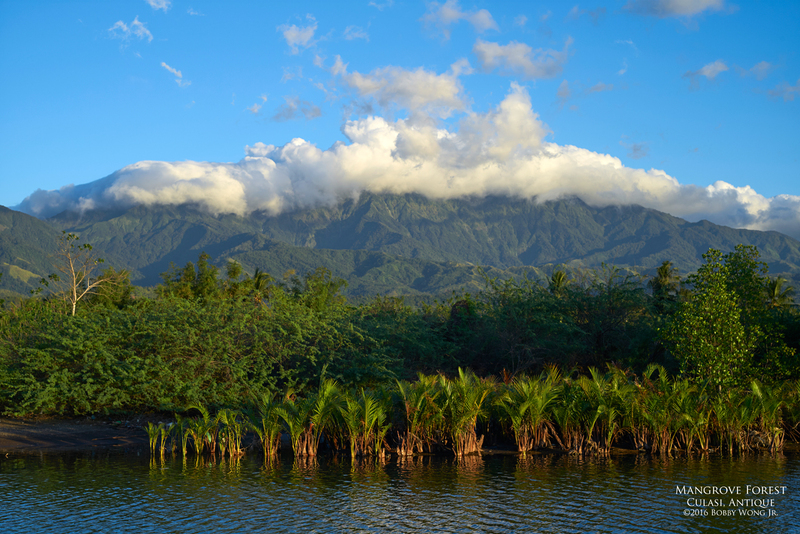 The distant clouds hugging the mountain slopes provide the humidity and rain that nourishes its primary forest cover, before collecting in mountain streams that eventually find its way to the sea. Along the way, the same water irrigate the rice fields we saw earlier, keep wide expanses of thick beach forests possible, before tip-toeing past mangroves and nipa groves along marshes that flush out to sea. Seeing is believing. Enjoy. Pixel-peepers: The terrain of a landscape is revealed when it's lit by strong horizontal light. Luckily, that occurs twice a day: shortly after sunrise or just before sunset. It's worth the wait.